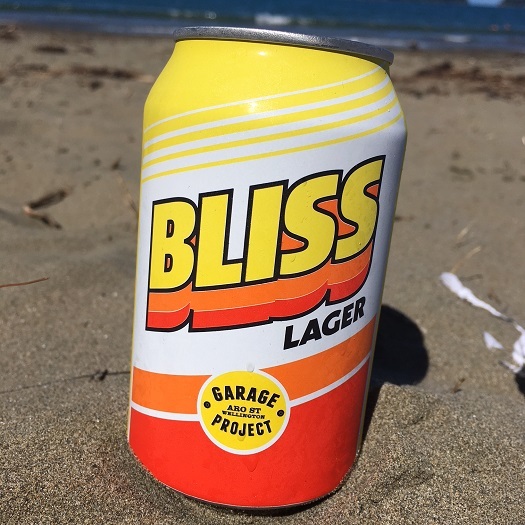 When I saw this beautiful-looking can of Garage Project’s Bliss Lager, I knew I had to have one at the beach. Props to Mount Maunganui artist Ross Murray for the striking design. Blurb about the beer: Bliss, a state of complete happiness and harmony. You can find it in the most familiar of things. Sun, freshly cut grass, the smell of a BBQ – in the right combination even the simplest elements can elevate an experience to another level. Brewed with New Zealand malt and Motueka hops, Bliss is fermented cold and stored at subzero temperatures to produce a delicately crisp, clean, easy drinking lager. Simple, familiar things taken to a new level. Drink yourself more Bliss. The review: You eat with your eyes, according to the old culinary cliché. That’s why presentation is so key at modern, fine-dining restaurants; your less likely to enjoy something if it looks ugly on your plate. I’m not sure if the same is true about drinking with your eyes, but if it is, Garage Project is undoubtedly leading the way. The Wellington craft brewery’s beers are among the best-looking in the country, and its Bliss lager might be my favourite one yet. There was just something so satisfying about popping the tab on a can of Bliss at the beach. It really is a thing of beauty. The beer isn’t too bad either – it’s crisp, refreshing, with a laid-back bitter finish. There’s a subtle taste of summer fruits, followed by a slightly malty backbone. As far as lagers go, this one is medium bodied. The verdict: Garage Project’s Bliss lager isn’t exactly mind-blowing, but the can’s retro summer design is. Beer/movie combination: I’m going to join the chorus of reviewers raving about Marvel’s record-breaking Black Panther flick. It’s a fun and action-packed film, with a memorable villain (something of a rarity in comic book movies) and surprising depth.